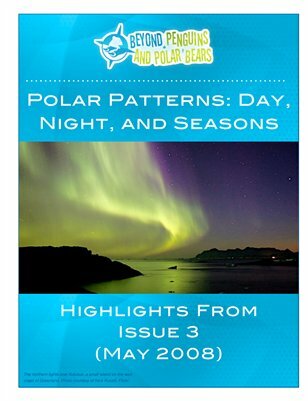 In this issue, we highlight ways to teach about the extremes in day and night and seasons in the Arctic and Antarctica. Students can observe patterns in nature: daylight, temperature, and changes in the plants and animals around them. Integrate science and literacy through investigations of cause/effect relationships. Help your students compare and contrast seasonal changes around the world with what they observe in their hometown. Finally, learn about the aurora and use this beautiful phenomenon as inspiration for art and poetry.